In 1974, Georges Perec spent three days in "an attempt to exhaust a place in Paris," making lists that described the activities unfolding around him as he sat in a cafe watching the world pass by. In some ways the idea behind the project is more interesting than the actual writing - the proposition that the nuances of a street corner could indeed be exhausted, or the possibility that in this case Perec exhausted himself before really doing justice to the initial idea. What Perec seemed to have missed is that street corners are not just places from which lists are born - they are sites with social and poetic histories, saturated with the imaginations of those who have passed through or sat down at their locations, including his own. And as such, at its very core any given street corner is more likely to be truly inexhaustible than it is to be a willing recipient of a simple conceptual frame. Poems for a street corner gestures towards the complexity of the street as a site for poetic engagement, asking artists to engage in their own creative ways with the possibilities - real or imagined - carried by any given spot on the street. 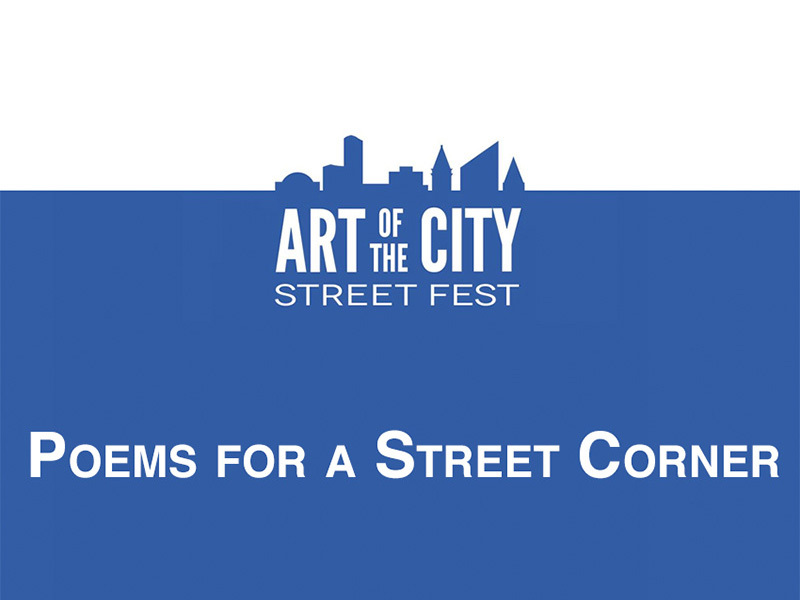 Participants were asked to select a site on the street where the Art of the City Street Fest will be taking place and to use that location as a starting point for a poem and a short video. The videos will be made accessible to viewers at the sites chosen by the artists - using a QR code trigger that will quickly let the audience bring up the videos on their phones. Featuring the work of: Breka Blakeslee, John Boucher, Laura Burgher & Tracy Gregory, Ellen Donnelly, Talena Lachelle Queen, Lauren Light, Kat Seidemann, Travis A Sharp, September Thorlin, and Matt Trease.